Welcome to Patio Place. Since 1989, our family-owned business has been providing Aliso Viejo with brand name patio furniture at significantly lower prices than our competitors. We sell and deliver patio furniture in wicker, extruded and cast aluminum styles, as well as brand name patio umbrellas, fire pits, barbecues, grills, bar stools, gas logs, fire glass, protective covers, bbq replacement parts, and more. For all your commercial and residential outdoor living needs, we offer rock-bottom prices and unparalleled customer service. We also help Aliso Viejo customers save money with our expert patio umbrella repairs, furniture frame refinishing treatments, and custom-made covers, replacement slings, and outdoor cushion services. Whatever your outdoor living needs, our knowledgeable staff will help you find exactly what you're looking for and offer you honest, expert advice. They will help you stay under your budget and select outdoor furniture (or equipment) that will beautifully complement the existing decor at your Aliso Viejo apartment, condominium, home, hotel, restaurant, cafe, spa, golf course, or other property. With excellent service, value pricing, and a huge inventory, it's no wonder we've helped thousands of customers across Aliso Viejo and the larger Orange County area furnish their patios, decks, poolsides, terraces, gardens, balconies, verandas, sun decks, porches, and other outdoor spaces. Open seven days a week, we invite you to visit our showroom conveniently located in Costa Mesa, near Aliso Viejo. We look forward to seeing you soon! 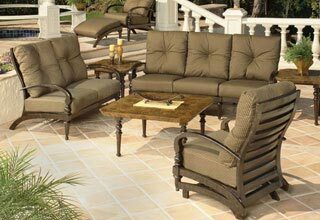 Patio furniture sets and individual bar stools, bistro tables, chaise lounges, cushions, end tables, fire tables, garden tables, loveseats, outdoor sofas, and sectionals. BBQs and grills in 24x18", 30x20", 36x20", and 48x22" sizes. Lights, access doors, warmers, drawers, range hoods, and other barbeque replacement parts. Fridges, kegerators, faucets, sinks, and other outdoor cooking accessories. Fire pits and fire tables made with slate, cast aluminum, marble, granite, and other materials. 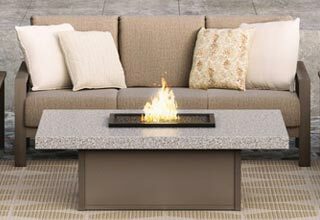 Ceramic gas logs, river rock, reflective fire glass, and other fire pit or fireplace accessories. 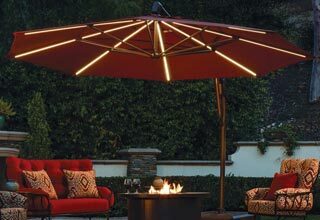 Patio umbrellas, cantilever umbrellas, auto-tilt umbrellas, custom-made umbrellas, and other umbrellas, ranging from 6 feet to 13 feet in diameter. Most of our inventory comes from manufacturer closeouts on the previous season's models which gives us the ability to offer some of the lowest prices in Aliso Viejo and the greater Orange County area. Our Aliso Viejo customers also choose us for our honest, expert opinions and recommendations: we can help you maximize your space usage, order specially-made outdoor furniture, match your existing or future decor, find solutions within your budget, and much more. Whatever you need, we'll make sure you leave feeling confident about your purchase. Visit us today. Replacement parts for barbecue islands (such as barbecue doors, drawers, lights, and more). Propane-to-gas (or gas-to-propane) conversions for barbecues and grills. Custom-made outdoor cushions for tailor-made benches of irregular height. Custom-made replacement outdoor cushions and pillows (with optional zippers for easy removal and cleaning). Custom-made replacement slings for chaise lounges and patio chairs (with optional padding for enhanced comfort). Refinishing treatments for outdoor furniture frames. 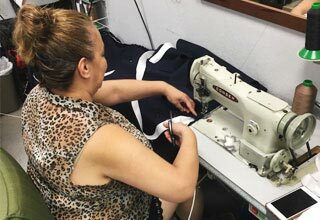 Silkscreening services for umbrellas and awnings (we can silk screen logos, monograms, and other graphics onto canvas and vinyl fabrics). Restringing, recovering, and rib replacement for patio umbrellas. For all the above, we use top-quality materials and components. If you are interested in custom-fabricated replacement outdoor slings, pillows, and cushions, we offer over 600 fabrics to choose from, including Sunbrella and Phifer fabrics, as well as manufacturer-recommended fabrics. These quality, brand name are stylish, durable, and warrantied against fading and other exposure damage. If you live in or around the Aliso Viejo area, call us today to explore how we can give your patio furniture, barbeques, umbrellas, and cushions a second life.